The abc Rail Guide has become quickly established as a must-have annual publication for the current scene railway enthusiast and is a traditional combined volume for the modern age. 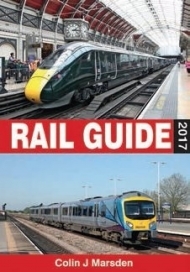 Listings are by user, with details of every locomotive and carriage used by that operator. Included are running numbers, depot, livery, owner, operator and name (if it carries one). Author Colin Marsden constantly revises the content and presentation in the light of comments from readers and users.